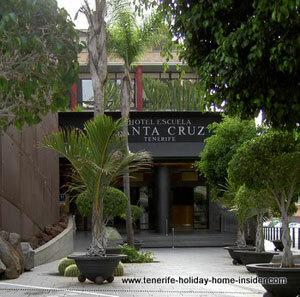 Santa Cruz Tenerife hotels accommodation is easily reached by the island's north airport, by tram, cab, bus or by any car. 10 to 15 minutes from Las Teresitas beach of San Andres. Summer camp classes for kids at the Museum of Man and Nature beside the T.E.A. Tenerife capital map for hotels, shopping and more. **** SILKEN ATLANTIDA HOTEL is a new, big, fancy tower hotel "with views to die for". 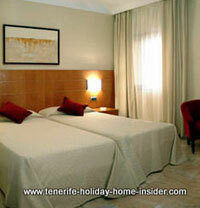 It is ideally located only 5-8 minutes walk from the Auditorio Tenerife,. Enjoy the hotel's stylish, bigger than normal rooms with free Wifi. Have the options of extra large beds and smokers apartments, a jacuzzi with spa to get pampered for wellness, a hotel gymnasium, large conference facilities. ****ESCUELA HOTELTenerife is a 72 apartments big hotel which teaches hotel management. Therefore, it sets an example to its students and thrives for hotel excellence. The Escuela Hotel is about 10 years old but, well maintained. **** The NH HOTEL in Tenerife's capital is a designer hotel of the popular hotel chain NH. This 1Nh Tenerife Hotel is situated in a quiet street around the corner from the town square Plaza de España as well as Plaza de Candelaria. Reach all the Tenerife capital's main commerce with downtown designer shops like Zara, other attractions and harbor easily from it! This hotel near the sea shore is a true Tenerife boutique hotel as depicted beside. Contemplate this most beautiful avenue where a genuine Henry Moore sculpture of a warrior is on free permanent exhibition with more scattered about art work below Rambla trees. 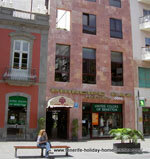 The *** PRINCIPE PAZ HOTEL Tenerife is also called CERCATEL PRINCIPE PAZ. 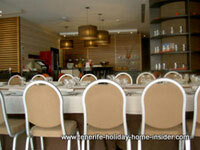 It is your best bet for well cared for accommodation in Tenerife when you want to shop till you drop. 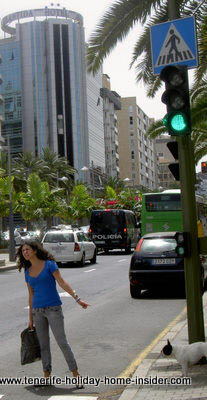 Click to find Tenerife capital parking information thanks to Zara fashion. Other designer shops by Lacoste and many more very interesting stores and charming boutiques are all around the Principe Paz Hotel in the capital of Tenerife, a few steps for Hotel Cercatel Principe Paz. All above hotels are central city hotels. They are my favorite hotels in the capital. They could all be reached on foot within about two hours. They all are near the Atlantic ocean and its port, best shopping, commerce, central banks, trade fairs, political departments, best best museums of Tenerife capital, also the nostalgic bars of the nostalgic Noria district with culture and historic buildings. They all offer good modern accommodation and services with minor differences. It remains to mention some Santa Cruz accommodation of olden day hotels like the Mencey of the Tenerife capital which lost grace by reviews from 5 stars to 4 stars, but looks like bouncing back now after extensive revamping. Go to the capital of the biggest of all Canary Islands... to learn more about it.